Last year, the Great Food Truck Race came out. At the time, trucks were pretty new and exciting. I at least have enough food truck hipster cred (if there is such a thing) to say that we heard of the show by seeing a sticker on the side of the Crepes Bonaparte truck, but even so it was new and exciting and pretty wild (a portable Slater’s 50/50 type burger truck? Wow!). These days, I am more cynical, aware of the fact that I can’t escape a food truck with a decent portion for less than $10 a head, I’ll usually have to stand in line half of forever, and that they’re roughly as fast as a particularly tired snail when it comes to turning around orders. Still, it’s fun stuff, and events are great places to have a really interesting and varied meal that just isn’t like anything else (as long as you get there within half an hour of opening). 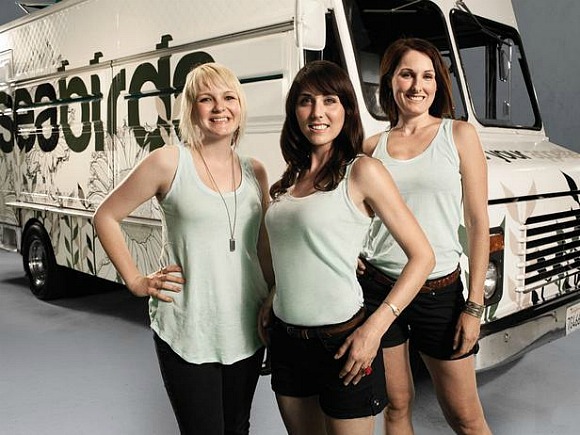 So, we had to tune into the next season of Great Food Truck Race, if for no other reason than two OC trucks were represented (the always-interesting Lime Truck and the Seabirds, aka the Charlie’s Angels of food trucks). We have been watching the show and generally enjoying it. I do think that the first series was better in a lot of ways – you had a lightning in a bottle feeling, and also the groups seemed much more genuine, like they were just looking to live the dream and had no real plan for anything. You could really feel the trials and tribulations and it always seemed to be an underdog thing. There was also a clear narrative with the always-victorious Nom Nom truck against the scrappy Grill `Em All kids – both were fresh out of college, but one seemed an unstoppable juggernaut while the others seemed like guys you’d see playing pool at the bar at 2 AM. This time, the groups are distinctly professional – they network as much as they try to sell food, and they constantly try to work restaurant connections. They leverage friendships, associations, ethnicity, and whatever else they can to get their food and get moving. For instance, at one point they were denied seed money. I imagine if this had happened to last year’s group most of them would have just sat on the sidelines and pouted. This time, it seemed to barely be a speed bump as the teams schmoozed restaurants and stores into giving them credit with apparently no effort. That brings me to a big issue with the show – with the better teams they have now Food Network seems to be trying to compensate with ever-crazier challenges and nonsense like the aforementioned lack of money. They have continued to have a mini cook off with winners getting an advantage, but they added a ‘speed bump’ where the host, Tyler Florence, thinks of some inane way or another to torture the contestants (banning all meat, making 2/3 of the team sit on the sidelines, selling everything for a buck, etc). I don’t really see what the point of this kind of thing is, since it seems like it has to skew the results something horribly, and I think Tyler is really starting to overdo the ‘sadistic host’ thing. Plus after a while I begin to wonder about the realism factor of the whole thing – trucks consistently park next to each other despite having whole cities to choose from, and they sure do resolve what would seem to be major issues such as having no money really easily. Anyway, I am starting to sound negative, which is not really the case – I enjoyed the original show a lot more (except, if I may show my hetrosexuality a bit, for the eye candy quotient being much higher this time around) …but I still have enjoyed this show – it’s something me, Burgandy, and the little one can all watch and be reasonably engaged by, and none of the trucks are particularly irritating or unpleasant (though this show could really use a villain, a la Nom Nom, have I mentioned that yet?). It is in the Food Network sweet spot of reasonably entertaining / kinda-sorta educational / inoffensive and relaxing content that makes it my Network of choice for ‘peel me off the ceiling after being underwater all day at work’ viewing.